Over the last couple of years severe and most frequent cyber-attacks have been witnessed by various industries. And it seems threats like viruses, hackers, data breaches and malware aren’t going anywhere anytime soon. They are evolving and as we 2019 approach these threats are becoming complex and more bigger threats. Therefore, it is essential for the businesses to make themselves aware about the latest cyber security threats of 2019 and ensure their security measures are at par. Certainly, no one can predict what new threats will be emerging coming year. But looking at the past years we have made a list of 9 biggest security threats that we can expect in 2019. Not only this we will also share tips with you to stay protected from these cyber security threats. 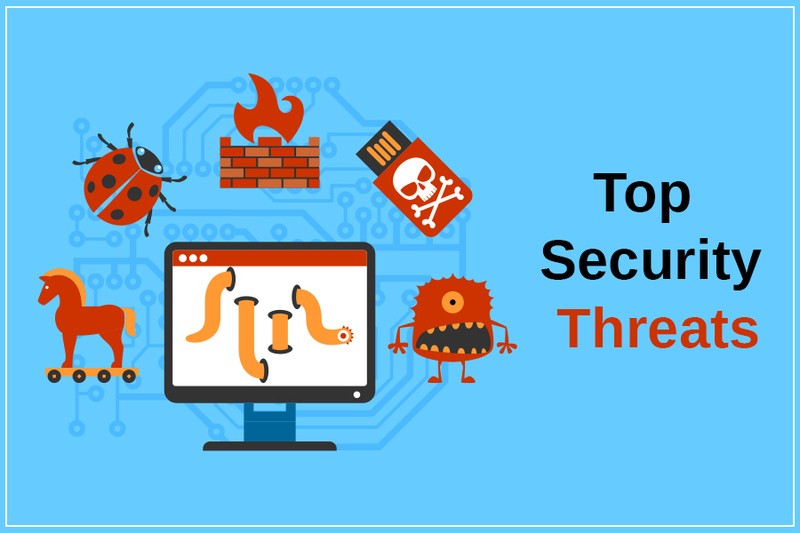 Here are top 9 biggest security threats of 2019 that you need to be aware of. Powerful network of compromised machines that can be controlled remotely and used to launch attacks at large scale are Botnets. Usually they comprise of millions of compromised machines. Botnets are used by hackers to carry out distributed denial of service (DDoS) attacks, send spam, steal confidential information and perform brute force attacks. The time around Black Friday that is this time of the year is personal favorite of hackers. Botnets are becoming popular amongst threat actors as they are easy to afford. Also, with more and more getting connected to Internet there is more room for latest devices that can be easily controlled and compromised. The best defense again these Botnets is to ensure that the machines never gets infected by worm or virus. Generally, people are unaware about their machine being compromised until it is too late. Therefore, performing regular scans using an updated anti-spyware like Advanced System Protector is necessary. As it is said one bad fish can spoil the whole pond similarly one malicious email, anonymous downloads are sufficient enough to infect and harm your machine. Computer worms and viruses have been around since the birth of cyberspace therefore one should never underestimate destructive power of worms and viruses. These programs are harmful, malicious in nature and are designed to infect core systems making networks non-functional. With time computer viruses and worms are becoming more notorious and problematic. Viruses are usually attached to a host file and can lay inactive until activated. This means viruses can infect the machine only when opened. Whereas worms can spread through the machine and can replicate then infect network, documents, spreadsheets, and other data. Computer viruses and worms are foundation for many high end advanced cyber threats. The way we use our systems is making things worse. The best way to stay protected from computer viruses is to install anti-spyware solution on all network and inter-connected devices. As this will help to reduce possibility of system being infected by a virus. Anti-spyware like Advanced System Protector is capable of detecting and removing malicious programs. Security and research team behind the product work hard to keep database update. Not only this automatic database update and deep scan offers strong protection and security. Are you also the part of current cryptocurrency hype? If yes, then you need to be aware of cryptocurrency hijacking most commonly known as “cryptojacking.” Cyber attackers are targeting individuals interested in cryptocurrency. What they do is they infect victim’s computer with a virus that helps them to use system hardware resources such as processor to mine cryptocurrency. Resulting in slow and sluggish and system user may not be able to identify this as it considers it a problem with the machine. But for attacker this is a way to gain financial benefit. As per security researchers in coming years cryptocurrency related crimes will bloom as they are lucrative and less risky than ransomware attacks. This means in 2019 we can see a boom in Cryptojacking attacks. With time cyber attackers are becoming smart. They now know people don’t download software from third party sources as they may contain virus. Therefore, they a new form of attack known as drive-by download is designed. This new attack form allows malicious code to be downloaded from an online site through app, integrated operating system, browser without any action taken by the user. To stay safe from drive-by download attack one needs to keep their browser up-to-date as it will help in detection of malicious site before they are visited. Besides, this using safe search tool is also a great idea as it will help to filter potential threats. Another cyberspace threat which has been around from long is phishing attacks. It is the most simple and popular form of attack designed to steal confidential user data like username, passwords, credit card details and other financial data. Threat actors use social engineering methods to collect data and design the attack. These attacks usually look genuine as attackers disguise themselves as someone you might know. Once the mail they send is opened, attachment is downloaded, or victim enters any financial details on the page to which he is redirected their purpose is solved. To stay safe from phishing attacks, one needs to be skeptical. Vigilance is the key to stay secure as these attacks are hard to avoid. But if you pay attention you can easily identify a fake email. Generally, phishing mails have many grammatical errors, they might ask victim to provide banking details or the mails may say you have won a lottery. Therefore, before clicking on any link or sharing any confidential data site credibility should be checked. It’s not only us who appreciate technological advancements. Bad guys too like it, as it helps them to design automated ways to exploit a system. Exploit Kits are discreet, hard to detect and are sold on the dark web. Attack designed to take advantage of an exploit kit works in various stages it starts from scanning the system and goes further. Once vulnerability is found the compromised website redirect web traffic to the infected site resulting in malicious payload. To stay safe from exploit kits one should use security programs that are designed to detect virus, intrusion software and are trained to detect phishing attacks. So far ransomware has been popular and the key threat of cybersecurity. A business attacked by ransomware take time to return. Ransomware encrypts user data and threaten to delete data if ransom is not paid. It is the most dangerous form of malware and with crypto currencies becoming popular it is becoming more devastating. To stay protected from ransomware attack antivirus software with updated database should be used. Apart from this backup of data should always be created to tackle unforeseen situations. Advanced Persistent Threats an attack where unsanctioned attacker code gets into the network and stays there for long without being detected. They sit there silently to steal financial data and other crucial security information. APTs use variety of techniques to gain access like exploit kits, malware and other advanced means. Once login credentials are collected APTs infect the system and start infecting other connected networks. It is hard to detect APT attack but there are certain signs like unusual network activity, huge amount of data access we can stay protected from APT attacks. In addition to this IT professionals should isolate critical data from the network and use application specific whitelisting to limit data access. Poor passwords are the biggest helping hand for cyber attackers. As they can easily hack accounts with an easy to guess password. Therefore, to stay protected from data breach attach one needs to make sure to use complex passwords i.e. a combination of numbers, alphabets and special characters. In addition to this one should avoid using same password for different sites. By keeping these small tips in mind and by constantly improving network and computer technology we have stay one step ahead of hackers in 2019. Unfortunately, this is like a cat and mouse race, but we can always protect ourselves by keeping biggest security threats and how to stay protected from these security threats in mind. As more and more people around the world are getting used to Internet, cybercriminals are also creating more advanced threats. They understand this fact and know not all are skeptical about online threats. But with time we need to change and stay aware of security threats that are devasting.